Dry roast the almonds and chop them to small pieces. Roughly chop the dates and coarsely grind them in a food processor along with cinnamon powder, cardamom powder and nutmeg powder. To ease grinding process, add a teaspoon of milk (or more as needed, but add gradually). Heat a non stick pan and add the ground mixture from food processor, cook for few minutes. Add the chopped almonds to this and mix well. Remove from heat and let it cool lightly to a bearable warmth. Then equally divide them and grease hands with butter and roll them into balls. For the size of balls (small bite size ones) I have made, I got 14. Store them in airtight container and enjoy !!! They look perfect and so much tempting with the glaze..Yummy! 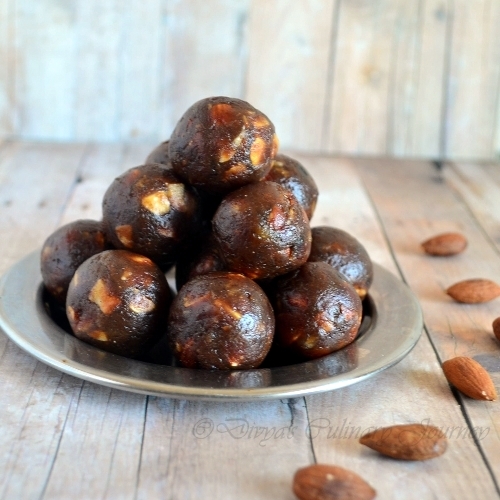 Delicious laddu with healthy dates and almond. Wow!! they look so yummlicious and perfect shaped. Looks scrumptious, I could munch on the whole lot in a day! I sure like to try this..dates is a good form of fibre. 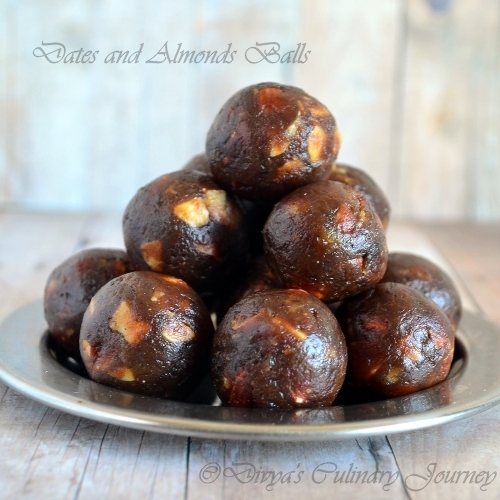 Healthy ladoos,kids will love this,will surely try this. I dont mind grabbing some and having rite now, damn cute laddoos. Yes, after all those fried and sugary food during Diwali I do need something like this. In fact I brought dates yesterday to make some ladoos. great recipe! Wow, what can go wrong with this combo, looks awesome.. 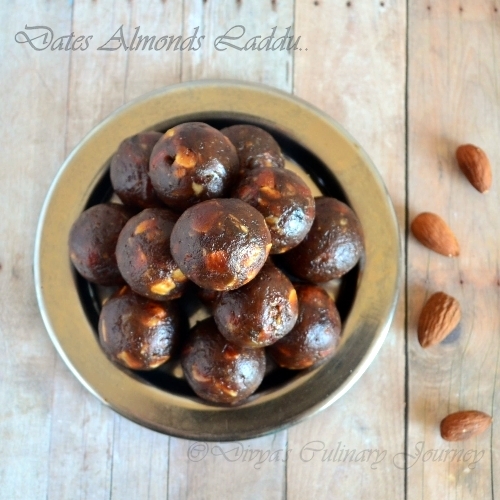 I am very surprised to know that ladoos can be prepared even using dates..going to try this soon..